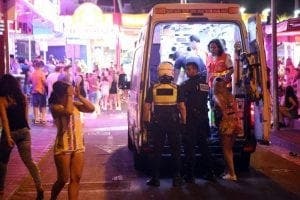 TWO British men have been arrested after a man was brutally beaten up in Magaluf. The shocking attack, which was caught on CCTV in the early hours of Sunday, showed a pair of young men punching and kicking the man to the floor after they had exchanged words with him. 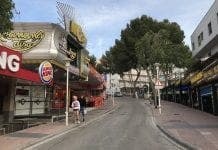 One of the men then stabs the victim with a broken bottle before continuing to rain down punches and blows to the head during the assault in tourist apartments in Punta Ballena. The attack lasted around two minutes with the victim’s friend appearing at one point before running away in horror as his friend was beaten senseless. The victim was rushed to hospital where is recovering from his wounds. The suspects were arrested on Sunday but have been released from prison on licence. “Released from prison on licence.” Would that be a licence to kill? Drunken, debauched violent Brits, need one say anymore? Savages! The same thing goes on in most British town centres, the drunken yobs are arrested and then let out to carry on with their lives. Don’t worry about the victims. British tourists are either drunkards or hooligans or both. It is a complete waste of money and resources to let them in.